The biomorphic forms of this somber painting suggest hidden messages that resist literal decoding. The shapes seem to be freely improvised, an impression that was often conveyed by American abstract art indebted to Surrealism. However, in fact, the composition is based on a gridded preparatory drawing that meticulously plots the design. Arshile Gorky, born Vasdanig Adoian in Armenia, was one in the array of immigrants to the city who created the so-called New York School. He came to New England as a teenager and moved to New York in 1925 at the age of twenty-one. Gorky then spent fifteen years devotedly absorbing the work of the great European masters, painting "with," as he said, Cézanne, Picasso, and others. He broke through to a unique voice only in the 1940s and in a short span of time (ended by his suicide in 1948) produced an intense, brilliant body of work. Steeped in memories of his homeland, his paintings employ an utterly contemporary vocabulary of abstract forms that possess the force of symbols but resist literal decoding. 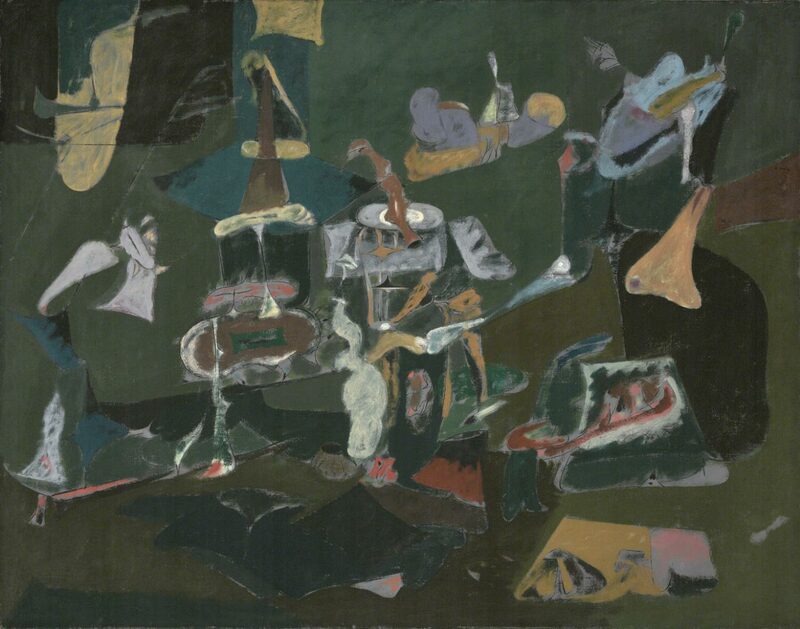 Dark Green Painting is one of Gorky's very last works. In retrospect, its dense surface and somber palette hint at tragedy. The artist's sophisticated use of unexpected colors is as remarkable here as in his luminous works of the early 1940s. Gorky is one of the great draftsmen of the twentieth century, and that quality is revealed as much in paintings such as this one as in his large body of drawings. His fluid field of fragmented and hovering shapes suggests what might be interpreted as an "automatic" composition. But, as in the case of much modern work once believed to have been freely improvised—ranging from the floating fields of Joan Miró to the allover surfaces of Jackson Pollock—this composition was intensely planned down to each detail. A large-scale drawing in pencil and crayon meticulously plots on a gridded page the design of the painting to follow. While the painter wished his work to look as though it sprang directly from his unconscious, the ability to convey that impression required a level of control and virtuosity developed over years of intense discipline. Twentieth Century Painting and Sculpture in the Philadelphia Museum of Art (2000), p. 95.